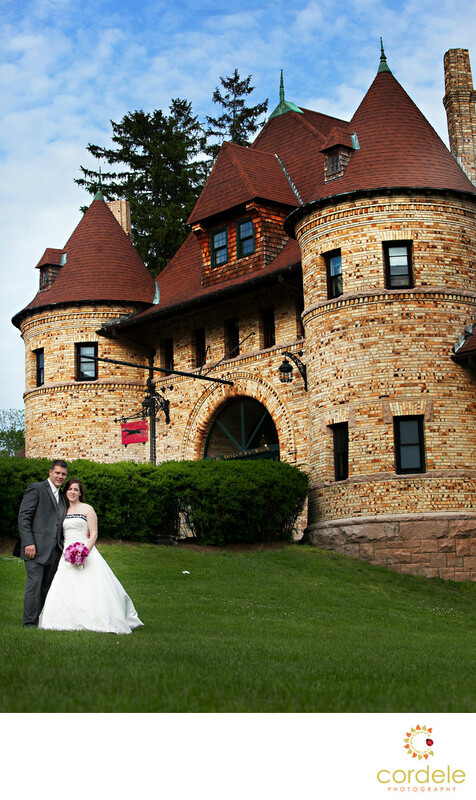 A bride and groom stand outside Larz Anderson on a beautiful summer day for their wedding photos! What can I say about Holly and Alan that I haven't already said. They are like family and when I first meet Alan, I loved him. He was perfect for Holly. I have known Holly since 8th grade and she is the sweetest most positive person I know. She meet Alan when her car broke down. She ended up going over to his shop and getting it fixed. The story goes that she ended up ripping her mirror off her car on purpose just to go back and see Alan again. A claim she disputes and says it was all just a big accident. When Alan and Holly picked their wedding venue they needed something unique. Alan loves cars. In our initial meeting we bonded over cars, because I love them too. We talked about the Dodge Viper (my dream car) and the car they were going to drive INTO the venue. They drove a car into their venue! After further explanation it was a car museum called Larz Anderson. Its in Brookline, Mass and has such beautiful grounds for a wedding reception. They have big hill and you can walk down and there is a big pond with beautiful trees and lots of places for fantastic photos! Holly and Alan had such a great wedding and I can't even tell you how much fun it was. At the end of the night Holly surprised Alan with an ice cream cart from Ben and Jerry's. They had his favorite ice cream and he knew at that moment he married the right women! Location: Larz Anderson 15 Newton St, Brookline, MA 02445.